Credit Card Travel Credits Guide: Amounts, Rules & How to Maximize! Understanding premium credit card travel credits can be tricky because each one has their own unique credit and rules to accompany it. For example, it would be very easy to confuse the Amex Platinum card’s airline fee credit with Prestige’s airfare credit. You see where I’m going with this? No worries, we are here to help :). Below is a quick little guide to the credit card travel credits and how to make sure you know what you’re going to get reimbursed for. Here is more information on each of the premium travel rewards credit cards and their respective credits. The Amex Platinum airline fee credit can be used to cover things like baggage fees, change fees and food/bev on board on a designated airline of your choice. It does not cover airfare, upgrade fees, miles purchases etc. Many people who can’t make use of this organically, purchase gift cards for certain denominations from their designated airline which they then use at a later date. Although gift cards are expressly excluded, they have been known to trigger the credit if you do it properly. There are whole forums dedicated to this topic such as this one from Flyertalk, for example. The gift cards can indirectly be used for flight tickets, so that’s a plus, but obviously the multiple steps required and gift card use limits for tickets can be a huge pain. Another huge pain about this benefit is that you must designate your airline. For some people this requirement is no big deal, but for people who don’t take too many flights a year and generally choose flights based on which airline is offering the best price, this benefit can be significantly devalued. The airline fee credit on the Gold card works the same as the Platinum card described above. This is one of the most lucrative credits available on any premium card and it couldn’t be easier to use. Just look at the list of what counts from Chase: airlines, hotels, motels, timeshares, campgrounds, car rental agencies, cruise lines, travel agencies, discount travel sites, and operators of passenger trains, buses, taxis, limousines, ferries, toll bridges and highways, and parking lots and garages. No designation or election necessary, just use your card for travel. The Citi Prestige travel credit used to only count towards airfare, however as of 2018 it now counts towards all travel purchases. This makes the Citi Prestige travel credit one of the easiest to max out in the premium card space. The American Express Hilton Aspire resort credit only works at Hilton resorts. Be sure to check the participating hotels before using the perk. It covers most of the properties you would want to use the perk at and is supposed to work towards the room rate and/or incidental charges. Comped drinks on the beach anyone? Airlines, hotels, car rental companies, taxis, limousines, passenger trains and cruise lines. This is definitely one of the best, the travel credit is incredibly easy to use and the credit is only $75 less than the annual fee. There have been issues with shutdowns, so be sure to meet the minimum spend organically. Details here. Airline Incidental Charges, including change/cancellation fees, on board charges, etc. Also, includes TSA PreCheck Application fee. Unlike the other cards on this list, the annual fee is waived the first year, that gives you huge value in conjunction with the credit. Another interesting thing about this card is that Authorized users are entitled to the credit as well. One downside here is that the travel credit includes reimbursement for TSA PreCheck, rather than including a separate credit for the fee. This credit does not include airfare and has some some major restrictions not just in type of purchase, but also limits you to Domestic originated flights with Domestic carriers. That’s pretty restrictive! See language below from BOFA’s site. Even though the credit is extremely narrow, the card is only $95 a year. I’m certainly not bothered that the credit is not as useful- especially when it outweighs the annual fee! When you open a card with a travel credit, it is important to maximize the value of that credit to help offset the annual fee. Thankfully most banks allow you to easily claim your credit while some others do make you do a little work. Either way, credit card travel credits are a valuable tool in squeezing great value out of travel rewards credit cards. Next articleMy Experience Using The Staples Chase Offer – What Works? 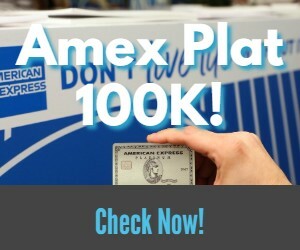 An Awesome Little Known Amex Platinum Perk Working in Real Life! Didn’t the Chase Sapphire Reserve change theirs to a Cardmember Year recently? I can look when mine arrives today to verify if necessary. Yes, now it’s Cardmember Year. Two things….The Amex plat cards give multiple gold hotel status, add the Marriot challenge and it blossoms with benefits…..the Prestige 4th night free offers tremendous savings on hotels, especially on better properties. Agree with you completely that they make the cards so much more valuable. Amex is my fave. I tried to just look at travel credits in a vacuum, but alas, no such thing lol. Note that City Natl Bank gives $250/calendar year for each cardholder on the account (that is, the primary member PLUS each authorized user). So for 3 cardholders, that’s $750/calendar year. Pretty, pretty, pretty good. Also note, the credit is only for certain American airlines (not all) and no foreign airlines. It’s great they give that credit for each- unique! Even with the Platinum Card that costs hundreds extra you don’t get it for the AUs, so that’s pretty cool. And. Thank you! I have the Ritz card and I’ve securely messaged each time for a charge, always worked. Is there really anything the Altitude Reserve offers that’s worth more than $75? Now, if only there was one for business cards . . . .
AMEX Business Annual fee is not $450.00 it is $595. Looks like this article needs updating to show all the current details. Business card gets $200.00 a year Dell merchandise credit. Personal gets some Saks 5th credits. Also AMEX points used for travel 30% rebate on your select airline or 30% on Any business or first clsss fare.